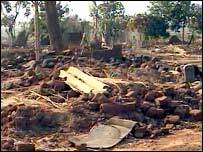 Amnesty International has released images showing the destruction caused in Zimbabwe by the government's policy of house demolitions in 2005. 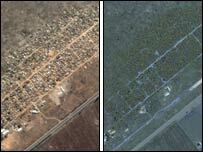 The satellite images show the destruction of one settlement near Harare, which had contained some 850 structures before last May. The human rights group says the photos are irrefutable evidence of how entire communities were obliterated. The UN says some 700,000 people were directly affected by the demolitions. The Zimbabwean government launched Operation Murambatsvina (Remove the filth), saying it wanted to eliminate illegal structures. Amnesty commissioned the satellite images to demonstrate the complete destruction of one particular area, Porta Farm, a large informal settlement some 20km (12 miles) west of the capital, Harare. It also showed detailed video footage showing the forced evictions and destruction in June. Porta Farm was established 16 years ago and contained about 850 structures, including schools, a children's centre and a mosque. Amnesty says that last June, in the middle of winter, armed police arrived with bulldozers. Porta Farm - which had been home to up to 20,000 people - was destroyed and the residents evicted. Amnesty says that the images - taken last month - show the horrifying transition of an area from a vibrant community to rubble and shrubs in the space of less than a year. "These satellite images are irrefutable evidence... that the Zimbabwean government has obliterated entire communities, completely erased them from the map, as if they never existed," Amnesty's Africa Programme director Kolawole Olaniyan said.